Yes, as long as you go to a reputable artist that is following all recommended safety precautions. Find out what these recommendations are by going through the Safety Checklist . Comparisons – It’s true that everyone has a different threshold of pain. What one person considers not painful at all could be devastating to another. Some people describe the feeling as a “hot scratch”. Some have said it was “annoying”. Most say it was not nearly as bad as they feared. But there is a little more than pain alone to consider when getting a tattoo. These kinds of products are really not recommended. Find out why by reading No Pain, No Gain. Not only does the Emla dull for only a half an hour or so, but also when the sensation returns, it is a shock to the system and the discomfort felt from being tattooed becomes more painful. Without the Emla it would have been annoying and possibly even a discomfort; whereas with the Emla, the returning sensation is ten-fold what would have been felt without the use. If you’re getting a tattoo, especially as an expression of your individuality, why would you want a tattoo just like someone else’s? Instead, find other pictures of what you’re looking for and have your artist draw up a custom design for you. Example: If you are wanting a tattoo of a penguin standing on a glacier, find real photos of penguins and glaciers. If you want a tattoo of a blue rose wrapped around a cross, find pictures of real roses and crosses that you like. If the pictures don’t show exactly what you want, just take them to your artist to use them as guidelines and tell them what changes you want made to the original pictures. A real artist will welcome the challenge of a custom piece. Tanning Beds – What about tanning beds? Indoor tanners are just as damaging as the sun, if not more so. The ultraviolet rays are much more concentrated and people tend to over-expose themselves in tanning beds, not realizing their own limits. Burning the skin damages a tattoo even more than slowly tanning. Again, if you must do it, protect your ink! Brand New Tattoo – Don’t put sunblock on a new or fresh tattoo – follow your artist’s aftercare instructions and keep your tattoo covered or shaded with clothing for the first few weeks. You can use sunblock once your tattoo has finished peeling and has grown it’s first protective layer of skin. But sunblock alone is not going to be sufficient for a new tattoo if it is exposed to direct sunlight for long periods of time. A tattoo is usually considered well-healed after about 3 months. When you get a tattoo, the area will be completely shaved before it’s applied, so at least you’re starting off with smooth skin. After a couple days of stubble and bristly skin, the urge to shave can be overwhelming. Unfortunately, at this point, shaving is about as brutal on your tattoo as a weedwacker. The wound is still fresh, and especially if you have any scabbing or raised areas, you run the risk of damaging your artwork by running a razor across it. Chemical hair removers are just as bad if not worse – you never want to put anything like that on a fresh tattoo. You will need to wait 5 – 10 days, run your finger over the tattoo, are there any bumps? Raised areas? Hard scabs? The tattoo should feel the same as the skin around it – if you feel anything then don’t shave, rather wait. 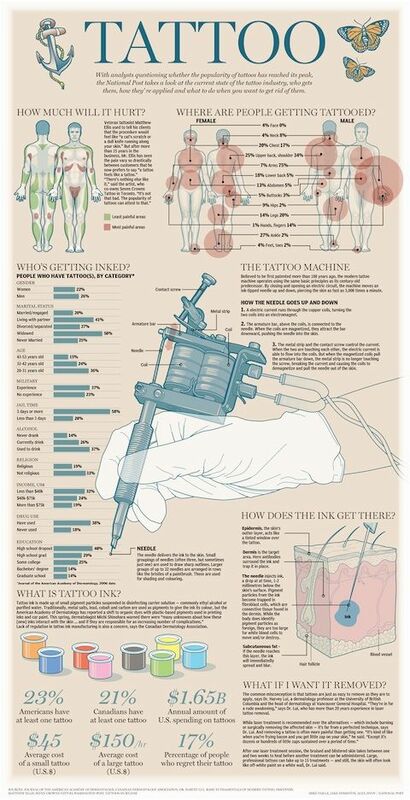 So, you want to learn how to tattoo or pierce? If you’re serious about it, you’ll do it the right way. The wrong way is by buying a “shop in a box” kit and trying to teach yourself. The right way is through apprenticeship – learning from a skilled artist with hands-on experience. To find an apprenticeship within your means that will provide the proper training to get you into the business of tattooing. This is not a “get rich quick” scheme. You are looking for an apprenticeship that will last long enough to provide you with the proper skills needed – not just in tattooing – but also in sterilization, proper cleaning, and business management. Among these skills you may also learn things such as needle making, prepping, making stencils and every other aspect of the business. A complete apprenticeship cannot be accomplished in just a few months time. A good mentor won’t even let you begin tattooing until you have learned all these other things. Finding a good apprenticeship is not an easy task. You may have to visit several studios before you find someone willing to take you in. You may not find anyone in your area, and relocation might even be a consideration. But the fact remains that if this is what you really want, it is more than worth it to do it right! Learning how to tattoo or pierce on your own is not only unwise, it is dangerous. You must be properly trained in sterilization techniques and how to avoid harming the customer. There is nothing more damaging to your own reputation than 100+ people out there showing everyone what a horrible tattoo or piercing you gave them. Or worse yet, the disease or infection they got as a result of your ignorance. Take your time and learn the right way. Hand poke tattoos bring a more traditional feel to tattooing, instead of using tattoo machines the needle is pushed in by hand and a design is created out of small dots. Hand Poke tattoos takes tattooing back to its roots and should definitely be tried by anyone collecting tattoos or just wanting something different.